Aurora 88 Minerali Azurite | Inkdependence! This is a pen review where I made a mistake. I really like the video I made for it, but I ended up not liking the pictures all that much, and I ended up forgetting to take some of the pictures I would have included if I'd remembered to do so. And then I gave the pen back BEFORE checking the images. Rookie move, Mike. Bush league. So, go watch the video. It's pretty good. I'll put some pics below and give a bit of commentary, but it's not all I wanted it to be. In some ways, that's okay with this review. I've taken a close look at the Aurora 88 a couple of times in the past. Here's the link for the black Aurora 88. 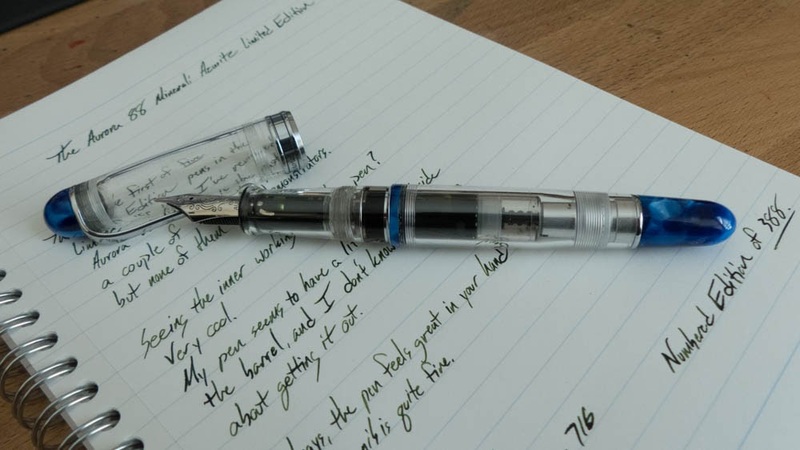 Here's the link for the yellow 88 with the flex nib. Check those out for comparison pictures of the pen with other pens and pictures of the pen with the cap on it. The 88 Minerali in Azurite is a really nice looking pen. 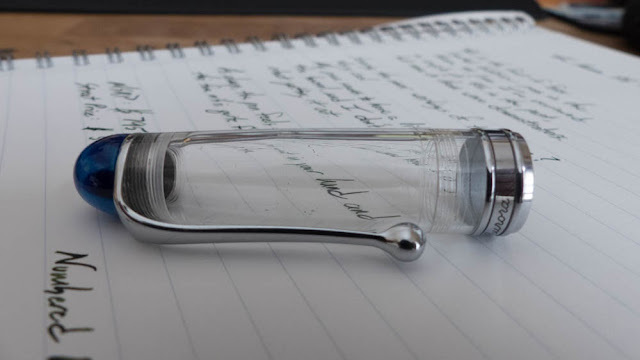 It's crystal clear, it's got those mineral touches, and it writes very nicely. The 88 nibs are really good. And the fact that they're made in the factory by Aurora is cool. And it's a numbered edition of 388, if you're into that sort of thing. I like this cap a lot. They don't use a cap liner, which is pretty rare. Most pens do better with one because they keep the nib from drying out. There aren't that many companies that can pull off a cap without a liner. Franklin-Christoph is good at that, and it appears Aurora does it well with the 88. 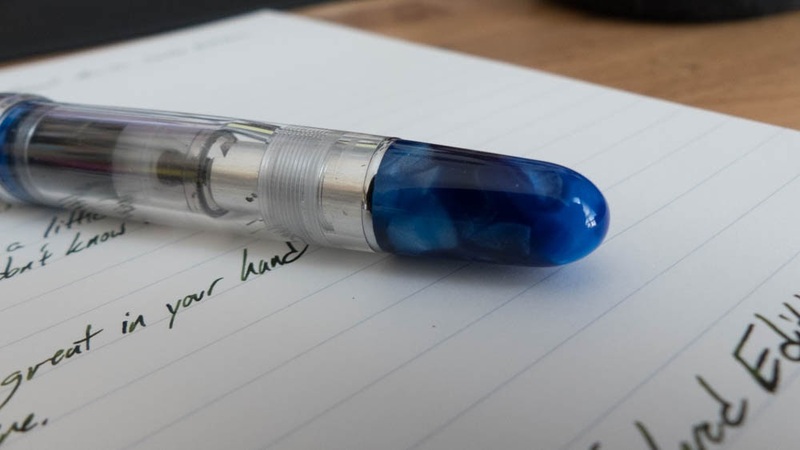 It really improves the look of a demonstrator. And here's the other end of the pen. These details really set off the rest of the pen. Here it is with some ink in it. 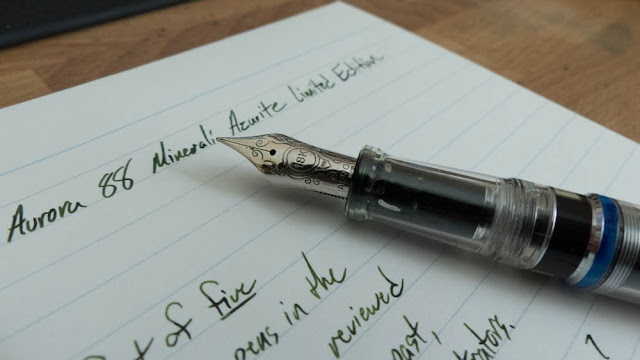 You can see the Monteverde Olivine really well through the barrel, and you can see the ink window here, too. 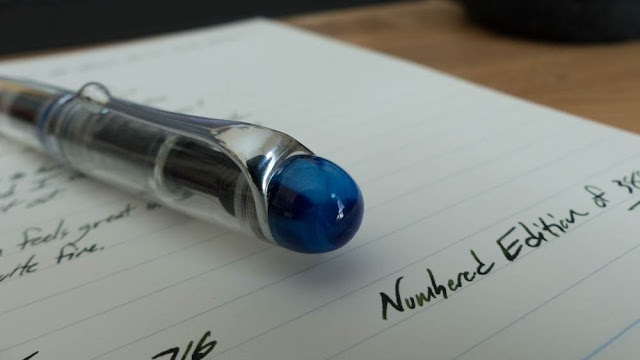 I do like when a demonstrator includes the same details as the regular pen. They could have left that out, but I'm glad they didn't. The section is clear, too, and this can lead some to question if it looks as it should. 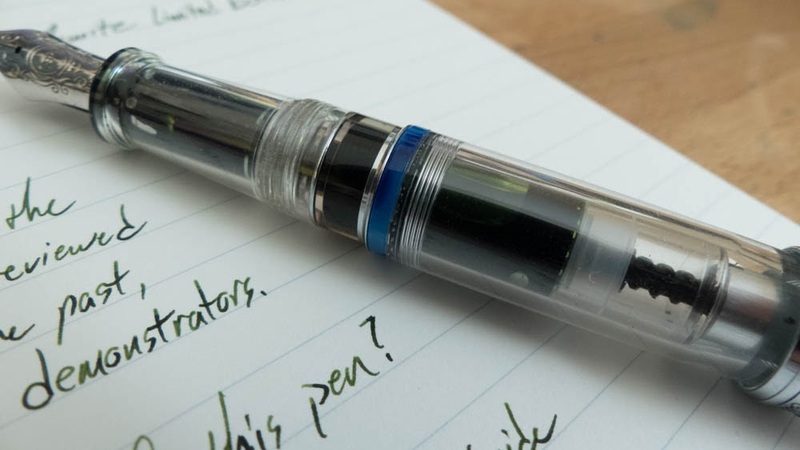 I've had lots of questions like "Should you be able to see the ink all around the feed like that?" Yep. You should. If you didn't, you wouldn't see it on the page, either. The only drawback of that crystal clearness is that you can see any little tiny bit of debris that might be in there. Mine had a tiny speck around the piston unit, and I don't know if it can be gotten out. That's kind of too bad, but most people say they wouldn't notice. 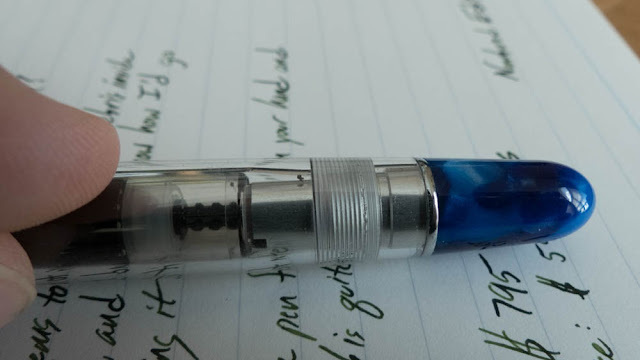 This is the only thing I don't love about the pen. It's difficult to entirely clean out. There's a bit of water in there that I just can't get out. This isn't as big a deal for most people, as most people won't use as many inks or need the colors to be as un-mixed as I do. Still, it's worth noting. 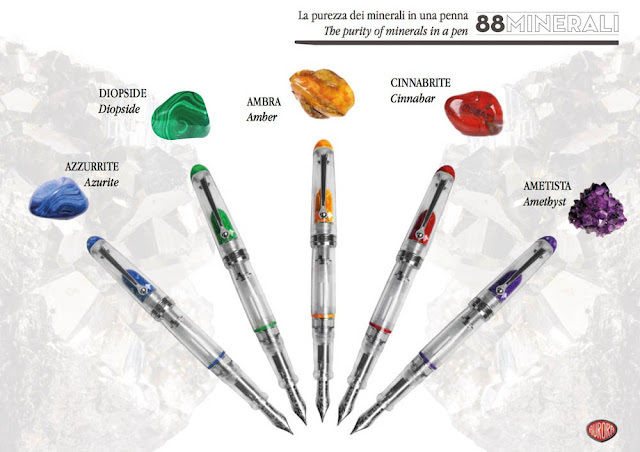 These are the upcoming Minerali pens, and there are a couple in there are are really cool. The green (available soon) is cool, but that Amber one is just beautiful. These MSRP at $795, but I've seen them as low as $595 or $650. That's pretty expensive, but that's how it goes with Italian limited editions. Oh I have used these pens in my high school and they were really good. Helped write a essay for me . They are super handy and easy to use and clean and they look good too. I am a huge sucker for stationery. So I always notice the tiny details of a pen or a pencil. 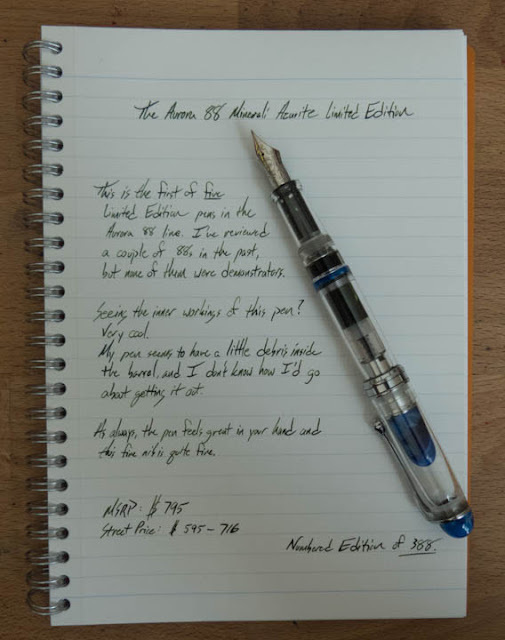 I really like the look of this pen and I would agree with you on how gorgeous the Amber one looks. I have used the green pen for several months. 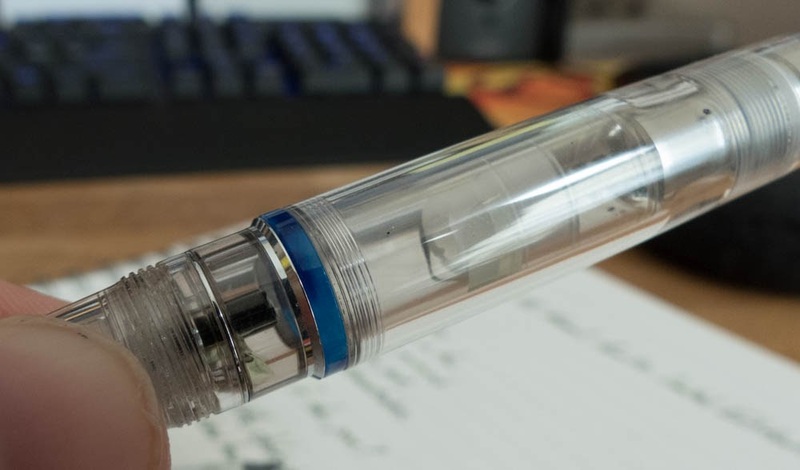 The nib unscrews to clean easily. The xf is great on cheap work paper. Shop around I got a brand new one for $385 on eBay. Aurora is a great great. It starts right up after 2 weeks ad does my Optima.